ViewRanger helps explorers around the world discover amazing places. 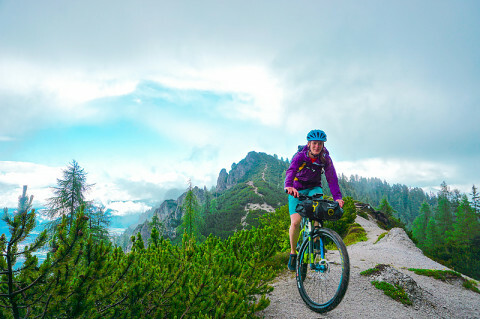 We recently caught up with adventurer Hetty Key about her recent bikepacking trip where she explored the gravel backroads and singletrack of Slovenia. 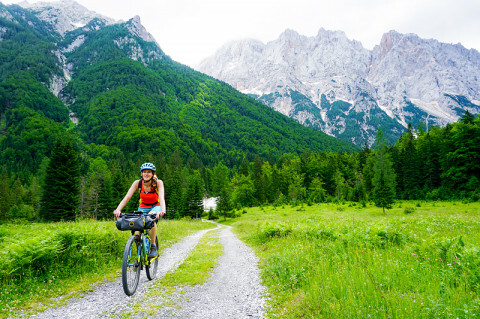 She cycled more than 400 miles over 14 days, linking quaint villages, lush green forests, crystal-blue swimming holes backdropped by snowy peaks. 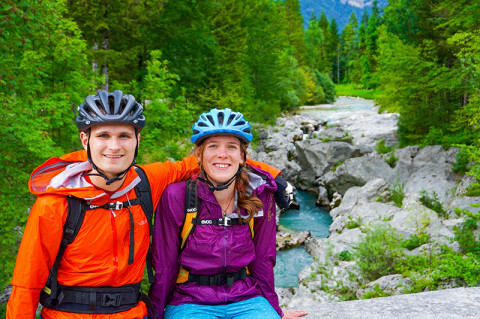 ViewRanger: We just heard you finished an epic bikepacking adventure in Slovenia. What's that about? Tell us the basics. Hetty: I’ve been into mountain biking for a while, but this was my first bikepacking adventure. 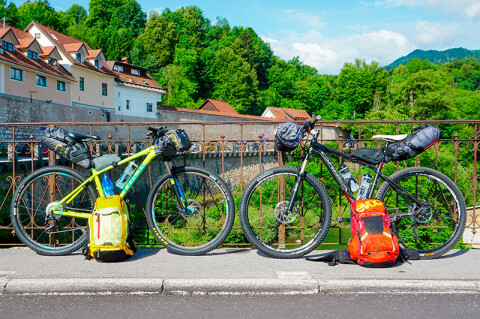 There are a lot of definitions for ‘bikepacking’, but essentially this is a multi-day mountain bike trip where you carrying everything you need. It’s really simple! That's what I loved about the idea of bikepacking - there are lots of ways of doing it and no hard and fast rules. In some ways, you can’t get it wrong!? With two weeks off work, I was adamant I wanted to go somewhere different and adventurous. Slovenia was perfect because it ticked both those boxes as well as fitting in with my budget. Once the seed was sown, I started reading more about this amazing country - the more I found out, the more excited I was. Everybody I spoke to who had been there raved about it. Now I do too! Did you go alone, with a friend, or guide? I went with my boyfriend, Tom. 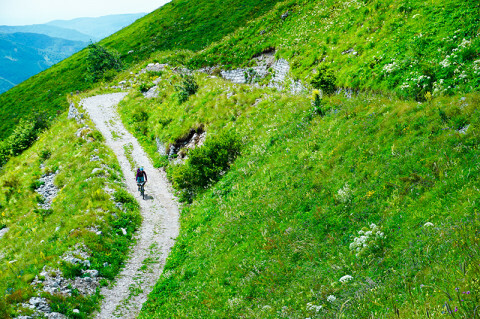 We’re both keen mountain bikers but have never done a trip like this before. That being said, we’re used to spending our holidays doing something a little mad or overly ambitious! With big exams looming, Tom had to leave all the planning, preparation and navigation down to me. His only criteria was that it was a relaxing holiday… I waited until we were on the plane before I showed him the route profile! Bikepacking is really taking off. What bike kit did you go with? Bikewise, I rode my trusty hardtail (a Trek Superfly 5) - it’s not the newest of bikes but it does the job, and I’ve grown pretty attached to it over the years. On the bike, I had a 9-litre handlebar pack, 4.5-litre accessory pocket, 1-litre top tube bag, 14-litre saddle pack and a 25-litre backpack. As I’m sure you can imagine, you can cram a lot into that… You can check out my full packing list on my website. How much did all your gear weigh? I didn’t weigh the final bags (at that stage I didn't want to know!) but, I think it was around 10kg. I'm not sure if this is a lot or a little, but it felt okay distributed around the bike. As always in hindsight, there are a few things I could have left behind or tried to upgrade to a lighter version… Then again, I don’t like being cold or hungry! How far did you cycle in a day? Is it hilly? Dirt roads? Initially, I’d planned to cycle 40 miles a day, every day! However, I quickly learnt that while this was possible, it maybe wasn't sensible! After all, I had to get myself home and back to work in one piece. That in mind I adapted the route, taking 80 miles off the total distance. This allowed me to have one rest day in Piran and one in Ljubljana. As for the terrain - it was mainly offroad on gravel tracks, logging paths and singletrack, all of which were very definitely hilly! With at least 3,000ft of ascent a day, our biggest day had 11,000ft of climbing - that felt hard! Every big adventure usually takes an unexpected turn. Any crazy stories you want to share? Surprisingly the majority of the trip went according to plan. Although, about halfway through we took a slight detour from the route to get to the coast for a rest day. Passing through a more industrial area, I decided we'd be better if we followed the cycle path - little did we know this would take us straight onto a dual carriageway… Retreat!! You must burn a ton of calories on a trip like this. Did you try any interesting food? Yes, that’s the great thing about these sorts of holidays - you can eat what you like! The food in Slovenia was fantastic. One thing I loved was that the style was really varied according to we were - so we got to try lots of things. In the mountains I ate big hearty dishes like goulash and stews, then as we approached the Italian border it was more pasta and pizza, then nearer the coast, it was lots of fresh seafood and fish. All delicious! As for the most ‘interesting' food... That was probably what we cooked up on our tiny stove - although I’m not sure this was interesting in a good way! The logistics of a remote trip like this must be hard. How did you plan it? Planning took hours! Although it’s worth noting, I love planning, so you maybe could spend less time on it that I did. How did you use ViewRanger? ViewRanger was an absolute essential for my trip - I couldn’t have done it without it! With everything uploaded to my phone and available offline, I ran my phone in aeroplane mode to save battery. Mounted to my handlebars in a waterproof case, I’d start a new track each day following my plotted route. Not only did this make navigation pretty easy (once I had got the hang of simultaneously map reading and riding a loaded bike! ), but it also meant if we wanted to deviate from the original route it was simple to do so. One of the most useful things for me was having a mixture of maps at my fingertips - the Survey and Mapping Authority of Slovenia maps were essential for the offroad sections, while ViewRanger Landscape and OpenCycleMap were best for the road sections. Before the trip, I’d been worried about battery life; however I was really impressed I could do about 12 hours of cycling before having to charge my phone on my power pack. So where's the next adventure? That’s a tricky question - there are SO many places I want to go! Right now, this summer, I’d love to do some more 2- or 3-day bikepacking trips in the UK. With so much out there it’s easy to overlook what’s on your doorstep.